The faeries surrendered their lands to the mortals when they withdrew to their hidden kingdoms, but they left behind much of themselves. From the graceful white spires found across the northern lands to oddly carved stones, elf hills, and unpredictable crossroads, fingerprints of the immortals can be found all across Rûl and beyond. More than their monuments, though, the faeries left behind people. Many who remained did so by choice, being unwilling to give up all they knew to unworthy heirs. A few, such as the goblins, were cast out. Some, though, were victims of their heritage, living between the two worlds and not quite belonging to either one. These people became the fauns, mortals who lived too long among the faeries or who were sired by them. Their unusual appearance and reclusive natures have led others to shun them, to drive them to the edges of the settled lands, and, sadly, to persecute them for no reason other than their unusual heritage. 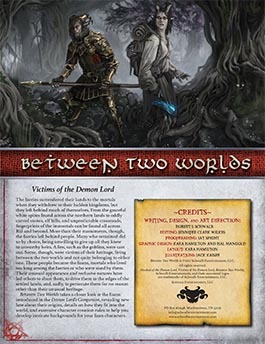 Between Two Worlds takes a closer look at the fauns introduced in the Demon Lord’s Companion, revealing new lore about their origins, details on how they fit into the world, and extensive character creation rules to help you develop intricate backgrounds for your faun characters.